This is a tour of Malaysia for those wanting to experience it in full with some even better accommodation. Along with the most modern infrastructure in the region and staying in three and four-star hotels mean both travelling in comfort and returning to the relaxing atmosphere of quality accommodation after experiencing the best of what real Malaysia has to offer. These really are some amazing things that few tourists ever get to see. You will also get the chance to shop in two of the best shopping meccas in all S. E. Asia of K. L. & Penang. After starting with some wonderful Thai food in Bangkok it will only get better before peaking in the food capital of Malaysia and possibly all of S.E. Asia on Penang island. Two international flights mean travelling in even more comfort along the way. Is there a better country in the world for a food and cultural experience than Malaysia? We doubt it. Perfect for first time Asia travellers. ADDED BONUS: Even though this tour ends in Penang there is still a flight back to Bangkok included to connect you with your ongoing travel plans. ( If you do not require this we will give you a discount). ( If there are no flight times from Penang to match up with your homebound flight from Bangkok we can offer accommodation in a three-star hotel near Bangkok airport including all transfers and breakfast for a last real Bangkok local area experience also. This for only A$80.00 per room, per night). ACCOMMODATION = (4 star hotels x 6 nights, 3 star hotels x 8 nights). BANGKOK - KUALUR LUMPUR - MELAKA - CAMERON HIGHLANDS, (Tanah Rata) - TAIPING - PENANG. 16 meals included as per itinerary. Tonight our Malaysia tour package; Experience Malaysia in comfort small group holiday tour will stay in; BANGKOK - Our Malaysia group tour officially starts when we check into your Bangkok riverside accommodation. A welcoming dinner will be had in the evening. D.
If you arrive early enough your free time could be spent visiting the enormous Chatuchak weekend market and/or, Wat Phra Kaew & the Grand Palace, Wat Pho, Wat Arun or Siam shopping centre. Or take a public boat with the locals on the Chao Phraya express to some local shops/markets in Nonthaburi. OR? Maybe just lay back and have a traditional Thai Massage. A month in the capital wouldn't allow you enough time to see it all. BANGKOK - After a lazy buffet breakfast overlooking the interesting riverboat traffic we have a free day to recover from any jet lag by the pool or get out and experience what this truly amazing city has to offer with your tour coordinator available to point you in the right direction whether it be sightseeing and/or shopping or a real Thai meal experience that can only be had in Thailand. One of the most visited cities in the world and it won't take long for you to find out why. B.
Tonight our Experience Malaysia in comfort small group travel tour will stay in; KUALA LUMPUR - A short international flight today will see our group tour in the Malaysian capital of Kuala Lumpur. Better known to all as simply K.L. A bit like a smaller version of Bangkok is K.L. with loads to see and do. The Petronas Twin Towers is the must-see for most. Visible from most places to begin with. For an even higher view of the city try the 421 meters high Menara KL (KL Tower) built on top of the Bukit Manas Forest Reserve. Being in the centre of Chinatown will mean a hard decision on where to dine also. So many choices! Eye popping for first time visitors. Maybe just join the locals in the economy food section with an ice cold beer. Why pay more than a few dollars when this is about as good a local experience as it gets. 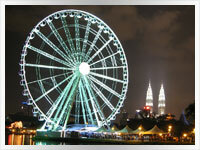 B.
KUALA LUMPUR - A totally free day to explore K.L. The city centre is reasonably compact which makes for an interesting stroll in itself. Just remember what's outside the door before you go back for seconds at the buffet breakfast. B. Not into shopping all day then well worth a visit is the Batu Caves, a short bus ride out of town. Walk up the 272 steps to the impressive Temple Cave. The Batu Caves is where the yearly, three-day Thaipusam festival is centred around. B.
Tonight our Experience Malaysia in comfort tour package will stay in; MELAKA - A short morning bus ride today will have our small group tour in the UNESCO World Heritage City of Melaka. Along with Penang, Melaka has one of the richest histories in all of Malaysia. Start at Melaka's most well known pink landmark of Stadthuys (Town Square) in the historic town centre which may be the oldest Dutch building in the East. A large number of museums in the area include the Islamic, Architecture, Peoples, History & Ethnography and Literature Museum among others. Then maybe, St Paul's Church, 8 Hereen St, which is a Heritage trust of Malaysia restored Dutch Era residential house, Cheng Hoon Teng Temple (circa 1646), which is still in use today by the local Buddhist community or the oldest functioning mosque in Malaysia of Masjid Kampung Hulu, (circa 1728). Melaka has far too many attractions to list here. Nonya food is one of the different styles more famous in Melaka but you will find a plethora of others, both local and international. Between seeing and eating you can browse at the many shops along the famous Jonkers street now called Jalan Hang Jebat or at the modern shopping mall of Dataran Pahlawan. B.
MELAKA - A free day to explore all of the above which is centred around today's Chinatown. Maybe a riverside stroll for Banana Leaf meal in nearby Little India? B.
Tonight our Experience Malaysia in comfort small group travel package will stay in; TANAH RATA - After a long days travel we will have the chance to cool down when we arrive in the hill station town of Tanah Rata, the main town in the Cameron Highlands. At 1800 metres above sea level it's blankets year round at night with cooler but not cold days most of the year. But with the cooler climate, one of the most popular things for visitors is hiking along the mountain trails of which there are numerous marked ones. Once again another foodies delight awaits in Tanah Rata with some of the best South Indian restaurants in Malaysia. Just one worth a mention is Bunga Suria with their Indian food just about as good as it gets. Lots of Arts and Craft and other souvenir shops nearby to tempt you also. B.
TANAH RATA - Check out the environmental awareness in the highlands at www.reach.org.my before either a morning or afternoon half day tour of the region today. The tour includes a visit to the Boh Tea Estate; www.boh.com.my a Chinese temple and a butterfly farm while all the time enjoying the great scenery as you go. B.
TANAH RATA - With lots of walks to do in the cooler air there's no excuse for just sitting around and trying the sensational food. You can still do that after working up an appetite. An optional Agro Delight tour maybe? or visit a honey bee farm for a look at a working apiary? 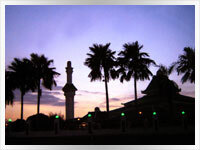 B.
Tonight our best tour package; Experience Malaysia in comfort small group tour will stay in; TAIPING - A short bus trip today will see our group travel tour in the lesser-known but no less historical town of Taiping. Taiping is small enough to walk around and take in the relaxed feel of the colonial era buildings of which most are well over a century old. Taiping also has a 62-hectare lake garden which includes one of the best zoos in the country. www.zootaiping.gov.my; The zoo opens in the evening also for a night safari. B.
TAIPING - A free day to explore Taiping. Just a few of the sights include; The District office, All Saints church, Old Kota Mosque, Train Station and the Chinese Ling Nam Temple. Most of the attractions are circa the 1880s. B.
Tonight our Experience Malaysia in comfort best tour package will stay on; PENANG ISLAND - The best of the best food awaits. A short bus ride today will see our small group tour in Georgetown the big and busy capital of Penang island. Georgetown has an atmosphere unlike any other place known to Baktrax in Malaysia and possibly all of S.E. Asia. It's one of our all-time favourite destinations. Lastly, but not the least, maybe a budget visit to a local dentist to offset some of your holiday costs. B.
PENANG ISLAND - WARNING! Danger awaits in Georgetown. Do not even think of seconds at the hotel breakfast. Meander around Chinatown, Little India or anywhere you please today But without doubt, the main purpose of coming to Penang is the FOOD! Our accommodation is within a few minutes walk of a multitude of budget Malay, Chinese or Indian restaurants. Penang's Curry Laksa or Indian Tandoori chicken with Garlic Nan bread are just but 2 of the better known local favs. This will also be another chance to eat the local way with a Banana Leaf Meal and it doesn't get much better or cheaper than a bottomless one at Krishna Villa restaurant in the heart of Little India. Fold your banana leaf over when full. B.
PENANG ISLAND - Another free day to explore some more of the island and more FOOD! FOOD! FOOD! Maybe some shopping at one of the modern shopping malls of Komtar, Prangin or the more upmarket Gurney Plaza. For those souvenirs just stroll along nearby Penang Road with its many shops and street-side stalls. Another Ice Kachang will help keep you cool as you go. A farewell dinner will be had in the evening. Leave room! B. D.
Our Experience Malaysia in comfort small group vacation tour is officially over when we check out of our Penang accommodation. A flight to Bangkok is also included to connect you with your homeward flight. B. You can now say you don't need to forego comfort to experience the real Malaysia. It doesn't get any easier for a genuine Asian cultural experience than with Baktrax in Malaysia. Truly Asian!